[S26] 1900 United States Federal Census, online , Year: 1900; Census Place: Lansing Ward 2, Ingham, Michigan; Roll: T623_716; Page: 6B; Enumeration District: 36. [S65] 1920 United States Federal Census, online , Year: 1920; Census Place: Lansing Ward 2, Ingham, Michigan; Roll: T625_771; Page: 13B; Enumeration District: 90; Image: . [S61] 1930 United States Federal Census, online , Year: 1930; Census Place: Lansing, Ingham, Michigan; Roll: ; Page: ; Enumeration District: ; Image: . [S797] Ancestry.com, Onondaga's centennial : gleanings of a century (n.p. : Online publication - Provo, UT: The Generations Network, Inc., 2005.Original data - Bruce, Dwight H.. Onondaga's centennial : gleanings of a century. Boston: The Boston History Company, 1896.Original data: Bruce, Dwight H.. Onondaga's centennial : gleaning, unknown publish date). [S26] 1900 United States Federal Census, online , Year: 1900; Census Place: Wolcott, Wayne, New York; Roll: T623_1174; Page: 20A; Enumeration District: 130. [S11] 1910 United States Federal Census, online , Year: 1910; Census Place: Huron, Wayne, New York; Roll: ; Page: ; Enumeration District: ; Image: . Source Citation: Year: 1860; Census Place: Throop, Cayuga, New York; Roll: M653_729; Page: 58; Image: 572; Family History Library Film: 803729. [S26] 1900 United States Federal Census, online , Year: 1900; Census Place: Throop TN, Cayuga, New York; Roll: T623_1013; Page: 11A; Enumeration District: 46. Perry Manrow, a former supervisor of the town of Throop and at one time prominent in Democratic politics of Cayuga county died at his home in that town this morning. The deceased was always a strong adherent of the late Charles F. Durston and had been a representative to more than one Democratic State convention. Of late years he has carried on an extensive business as market gardener. The funeral will be held at his late home in Throop Saturday at 3 o'clock. Burial will be made in Pine Hill cemetery. Find A Grave Memorial# 77352412. [S6] Ancestry.com, 1850 United States Federal Census (n.p. : Online publication - Provo, UT, USA: Ancestry.com Operations, Inc., 2009. Images reproduced by FamilySearch.Original data - Seventh Census of the United States, 1850; (National Archives Microfilm Publication M432, 1009 rolls); Records of the Bureau of the, unknown publish date), Year: 1850; Census Place: Aurelius, Cayuga, New York; Roll: M432_482; Page: 343A; Image: . [S26] 1900 United States Federal Census, online , Year: 1900; Census Place: Otego, Otsego, New York; Roll: T623_1145; Page: 15B; Enumeration District: 131. 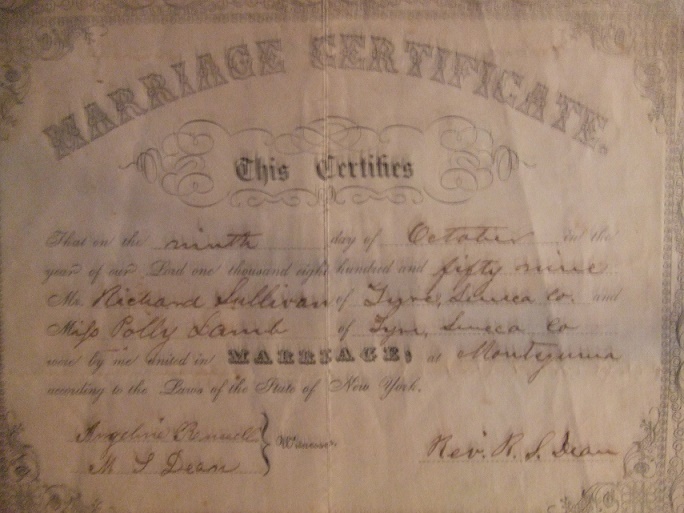 [S2] 1880 United States Federal Census, online , Year: 1880; Census Place: Otsego, Otsego, New York; Roll: 916; Family History Film: 1254916; Page: 328C; Enumeration District: 112; Image: 0310. [S11] 1910 United States Federal Census, online , Year: 1910; Census Place: Otsego, Otsego, New York; Roll: ; Page: ; Enumeration District: ; Image: . Francis Springstead lived in 1810 at Aurelius, Cayuga, New York, USA.1 He married Ellen Nora Vrooman, daughter of Unknown Vrooman. Francis Springstead lived in 1820 at Cato, Cayuga, New York, USA.2 He lived in 1840 at Mentz, Cayuga, New York, USA.3 He died between 1840 and 1850. [S14] Ancestry.com, 1810 United States Federal Census (n.p. : Online publication - Provo, UT, USA: Ancestry.com Operations, Inc., 2010. Images reproduced by FamilySearch.Original data - Third Census of the United States, 1810. (NARA microfilm publication M252, 71 rolls). Bureau of the Census, Record Group 29. Nationa, unknown publish date), Year: 1810; Census Place: Aurelius, Cayuga, New York; Roll: 31; Page: 1202; Image: 0181385; Family History Library Film: 00068. [S16] Ancestry.com, 1820 United States Federal Census (n.p. : Online publication - Provo, UT, USA: Ancestry.com Operations, Inc., 2010. Images reproduced by FamilySearch.Original data - Fourth Census of the United States, 1820. (NARA microfilm publication M33, 142 rolls). Records of the Bureau of the Census, Record G, unknown publish date), 1820 U S Census; Census Place: Cayuga, New York; Page: 76; NARA Roll: M33_68; Image: 90. [S3] Ancestry.com, 1840 United States Federal Census (n.p. : Online publication - Provo, UT, USA: Ancestry.com Operations, Inc., 2010. Images reproduced by FamilySearch.Original data - Sixth Census of the United States, 1840. (NARA microfilm publication M704, 580 rolls). Records of the Bureau of the Census, Record G, unknown publish date), Year: 1840; Census Place: Mentz, Cayuga, New York; Roll: 270; Page: 217; Image: 441; Family History Library Film: 0017181. [S9] Ancestry.com, 1860 United States Federal Census (n.p. : Online publication - Provo, UT, USA: Ancestry.com Operations, Inc., 2009. Images reproduced by FamilySearch.Original data - 1860 U.S. census, population schedule. NARA microfilm publication M653, 1,438 rolls. Washington, D.C.: National Archives and Records, unknown publish date), Year: 1860; Census Place: Montezuma, Cayuga, New York; Roll: M653_729; Page: 752; Image: 275; Family History Library Film: 803729. [S44] Town of Montezuma Records, online http://web.archive.org/web/20020215005729/http://…, (Waybackmachine), Springsted, Julia Ann May 1, 1893 71-0-0 Cayuga Co. Francis Springsted Ellen Nora Vrooman. [S44] Town of Montezuma Records, online http://web.archive.org/web/20020215005729/http://…, (Waybackmachine), Springsted, Jacob Jan 15, 1901 83 Aurelius. [S11] 1910 United States Federal Census, online , Year: 1910; Census Place: Auburn Ward 6, Cayuga, New York; Roll: ; Page: ; Enumeration District: ; Image: . [S26] 1900 United States Federal Census, online , Year: 1900; Census Place: Auburn Ward 6, Cayuga, New York; Roll: T623_1012; Page: 8B; Enumeration District: 12.